This just in via the Boston Globe: One Laptop Per Child is selling XO laptops like hotcakes! [T]he government of Peru has signed a contract to purchase 260,000 of the $188 machines. "It was notarized five minutes ago," he said, adding that the Peruvian order will make it easier for the foundation to sign up more countries to the program. "It's momentum." Negroponte also said Mexican billionaire Carlos Slim has purchased 50,000 of the machines for distribution in his country. "He's an old friend, and he's been involved in this from the beginning." Now while that isn't the 250,000 XO laptops Slim promised earlier, it's better than a Nigeria, where OLPC's partner is now pushing Classmates with Windows and OLPC is fighting a patent infringement lawsuit. Congratulations, One Laptop Per Child! While its not the 10 million that Nicholas Negroponte promised in 2006, it's a damn good start. One year from now, OLPC XO will be the brand name and the best selling laptop of all time. Michael Bryne, I totally agree. Its only a matter of time before the general public realizes that a laptop (XO is true "laptop" indeed) does not need the lastest video card, 4GB or more of memory, Core 2 Duo processors or an LCD screen the size of HDTVs or $$$$ software installed for basic stuff like internet access or word processing. I believe Linuxbios is the future. Once this goes fully worldwide and gets advanced a little more, communication via mesh networks running on Linux machines might just be the preferred method of communications..
Just makes me want my XO-1 sooner! As I wrote in an earlier thread, I think the "What is that and where can I get one?!" reaction is about to be widespread at WiFi spots around the U.S. and Canada, certainly, and in as many other places as folks have been able to arrange shipping from the U.S. I bet there will be quite a few orders in the last two weeks (that is, from 14th Dec to the end of the year) which would not otherwise have occurred but which will take place because of in-person experience with someone else's XO in a public place. On that same note, I'm going to hold off on ordering the one my mom wants until my first-day order comes in, to make sure she is OK with the small screen and keyboard. So it is at least possible (though I doubt it) that sales will be lost, if the machines are just not what people expect. A few will, no doubt, but I am certain the trend will be far the other way. Someone mentioned (in another comment, different thread) they'd like to be able to hand out a pamphlet or something to people who inquire about it, and I'm in the same boat. I wonder if anyone knows of (among the materials created by Pentagram, say) a one-page PDF suitable for keeping a few copies of around, in case people ask me about it while I'm sipping coffee at Borders ;) Do *you* know of one? 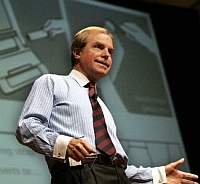 Why does nearly everyone who posts here use that same picture of Nicholas Negroponte?!?! It is completely obsolete (look at the laptop in the background) and I am sure I am not the only one who is sick and tired of that picture! I am the one who posts that photo of Negroponte. And I use it again and again because there are few of him that say "OLPC". Find or make one better and I will use it instead. Hopefully people won't be let down by the lack of Windows software and the general slowness of the laptop (compared to normal notebooks). 190,000 is a lot of people and I'd be surprised if over 80% of them know the specifications and know what they are getting into -- no/little tech support. I don't see any evidence for 190,000 sold thru give 1 get 1, although it will probably end up selling half that much by the time it closes at the end of December (times two for the laptops given away). They sold 45,000 in the first 9 days, half of which were sold on the first day, meaning they are selling an average of 3000 a day now (prob. declining). That would make it closer to 100,000 so far when you double the number to include those given away. The Eee PC from Asus is selling faster, and yet Asus' goals were to sell 3-5 million Eee PCs by 2009. Compare that to Negroponte's goal to sell 150 million by the end of next year. I'd say that's a bit off. I prefer the XO to the Eee PC for the following reasons. The main advantage is Wi-fi: To conserve as much battery power as possible the wi-fi adapter can operate even when the main processor is switched off or asleep. It is able to do this by having its own in-built low power chip. merry christmas to OLPC, i wish they have a top selling news year. I agree with your other reasons, though, and decided to spend my $400 on an XO rather than an Eee, though I hope eventually to play with (if not own) an Eee as well. one interesting note about uruguay: it has less than a million people aged 14 years or less. That means that 100,000 represents 10% of that total group. If they pick on age group, like 6 or 7 uruguay can be in fact be the first country in the world to have a 1:1 laptops per child ratio in a specific class year. For a sense of perspective Peru has 28 million people (4 mi under 14) and mexico has 100 mi (around 15 mi under 14). This makes uruguay the most interesting purchaser. Uruguay also has an option for 300,000 more to be ordered as soon as the first 100,000 are proven to be a success. The first 1000 units have been delivered now in Uruguay, Iven Kristic was there to make sure everything is going smoothly including installing of latest software build manually and activating Bitfrost on those laptops making it impossible to steal those laptops since Bitfrost is built-into the hardware. As for Eee, it does have a rotating fan, cause Intel ULV is running much hotter then the AMD Geode processor. Latest news is Eee is out-of-stock everywhere and Asus is now selling a $499 version, which probably means Asus was loosing money on selling the $399 version and thus they prefer to now sell the even more expensive product, $500 bucks, congratulations Asus. Forget about the $299 also, Asus is most probably not going to mass produce that, at least not built around the ULV. "The government of Peru has signed a contract to purchase 260,000 of the $188 machines." This is no true, the peruvian congress has approved a budget for 40,000 and this dont means that finally the Ministery of Education will buy the machines because an order will be cancelated any time. In last months many approved orders were cancelated, ambulances for the Ministery of Health and 4x4 cars for the National Police. However the most important is the political instability and the conflicts with the teacher union. A new minister will cancel all. Luis Gustavo, the 220.000 acquisition is inside the (overwhelmingly complex and impossible to read) Budget Law for 2008. It complements the 40.000 acquired through a budgetary extension already approved. So, technically, it cannot be stopped unless one of the participants in the tender objects (Intel did not participate and has decided not to interfere) or if there are issues in the acquisition as defined by any internal inquiry by CONSUCODE (the body that supervises acquisition by Peru's government) which I don't foresee. For all I can gather from a variety of sources, the current Education minister is staying at least till July 2008; unless there's a serious backlash, which doesn't look probable right now, the next education minister will not stop the acquisition (he cannot do that since it requires changing the budget law, complicated process) so the "best" he or she could do will be not to buy any more computers in 2009.
Who knows what will happen in 2009. But for now, Peru's acquisition looks pretty certain. Not that there's anything I agree about it, but that's another story. If there is an *average* of 2m a day, and half of the total sales came in on the first day, then your numbers are skewed. You would have to figure out what is the Average amount that came in every other day to extrapolate future and current sales past the 45,000 that was quoted. Kent: I have made a .pdf pamphlet. I thought you had a really good idea. So I took images off Google, and text from laptop.org, and the wiki site. I put them together to make a one page front and back pamphlet for everyone to carry around. 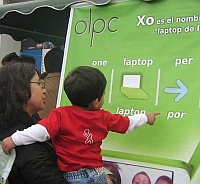 This way you can more easily spread the word about OLPC when you or your child are using the XO!